Last day of my Shorashim Birthright trip, Sh-18-271. After an emotional goodbye, I got a ride from the airport to Pardes so I could drop off my bag with Aunt Gail (Marc's been staying with them in Kfar Adumim, near Ma'ale Adumim) before Marc & I headed out to look at an apartment. The apartment was great, but unfortunately not the right location so it didn't work out. We went to grab some lunch, Aunt Gail drove us back to Kfar Adumim, and I passed out, couldn't keep my eyes open no matter how hard I tried! After class Marc & I went to Emek, had lunch & continued the apartment hunt. This one was in a great location, however the apartment was a bit shady (more specifically, the appliances were a bit shady), so again a no go. 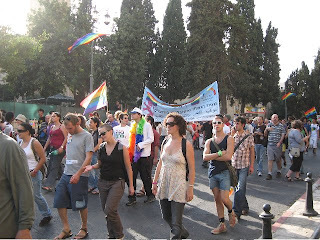 We walked around for awhile, and watched the Jerusalem gay pride parade. Some crazy intense security, they kept asking Marc for his passport. This woman was carrying an awesome sign. It said: "Anu ohavim et kol yeledenu!" meaning, "We love all our children!" Had dinner downtown (sushi) with Marc's cousin Judy and her husband Oren, then back to Kfar Adumim. Walked over to Sari's for lunch, stopping on the way to sit in the park for a bit. Lunch was great, picnic-style at Merkaz Hamagshimim where Sari's living (and where I stayed a few years ago, back when Samara was living there). BTW, for those of you who want to hear Marc's side of things, here's his blog.